GENOA, Italy, January 16, 2012 (ENS) – Italian Environment Minister Corrado Clini declared a state of emergency today after the cruise ship Costa Concordia hit a rock off the coast of Tuscany early on January 13. 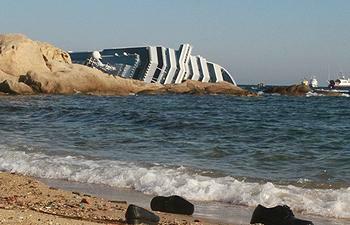 The ship capsized immediately offshore of the island of Giglio, which is part of the Tuscan Archipelago National Park. Fuel has begun leaking from the overturned ship and 198 drums containing hazardous substances from the ship have been lost at sea, said Clini. Most of the more than 4,200 passengers and crew were rescued and taken to the island, as well as to the mainland 16 kilometers away. To date, at least six people have died and 64 were injured, with 15 still missing. The ship is reported to be slipping off the Giglio rocks. Search-and-rescue efforts have been suspended as seas near the island grow rougher. 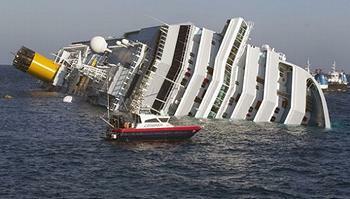 The salvage company Smit has been contracted to remove the fuel from the Costa Concordia. The company has said crews will begin pumping operations after the search and recovery is completed. Smit estimates it will take more than two weeks to pump the 2,400 tons of fuel off the vessel. Workers with the Environment Ministry have placed absorbent containment booms around the wreck, which leaking a slick of light fuel. The biggest concern is that the ship’s heavy fuel could leak before it can be removed from the ship. Giglio is one of seven islands that form the Tuscan Archipelago, a chain of islands between the Ligurian Sea and Tyrrhenian Sea, all of which are protected as part of the Tuscan Archipelago National Park. On Sunday in Livorno, Clini met with Tuscan officials, local authorities, Italian Civil Defence, the Fire Department, the National Institute of Health, Ispra, the Operating Unit of Ecological Carabinieri, and officials of the Italian Coast Guard. “The Ministry of Environment is on the side of the region, local authorities and communities to address the problem of Livorno and will forward all the skills and support needed to decide which interventions to protect the marine environment,” Clini said. 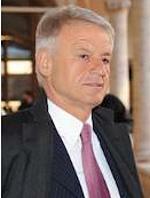 Clini said he and Tuscan President Enrico Rossi have agreed to work together to prevent risks to the environment and public health from the shipwreck and in general, to address the navigation of large vessels in sensitive natural areas. Italy’s largest environmental group, Legambiente, welcomed Clini to Livorno and asked him in an “open letter” to make the sea surrounding the Tuscan Archipelago a protected area. “In only a few months his ministry has restored the service of prevention and intervention against the risks of pollution after years of cancellation, the years when we relied on good luck rather than on serious emergency work,” said Legamiente. The Italian-flagged Costa Concordia is one of the 15 ships of Costa Crociere, doing business as Costa Cruises, a British-American owned Italian cruise line, based in Genoa, Italy, which is under the control of the giant cruise corporation Carnival. Costa Cruises’ chairman and chief executive, Pier Luigi Foschi, apologized for the disaster at a press conference in Genoa today, saying the captain, Francesco Schettino, had sailed too close to the island without permission. Foschi said the Costa Concordia’s route was set electronically before it left Civitavecchia near Rome on January 13, carrying more than 4,200 passengers and crew, and the captain’s deviation from that route was unauthorized. Schettino has been arrested by Italian authorities and is being held on suspicion of multiple manslaughter and abandoning ship. He claims that nautical charts do not mark the rocks that ripped a 50-metre (160 ft) gash in the ship’s hull.